Previously available on vinyl only, now on Cassette. 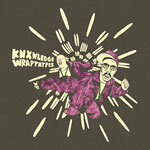 Third album on All City from LA via Philly beat machine Knxwledge. Straight up rap remixes culled from his Wrap Taypes series. Cover art by Gangster Doodles.